This, then, is the time to pause and reflect on what has been; and how one may wish to step forth as the light returns. 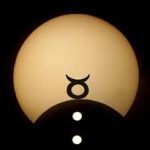 Author Susan J KatzPublished on August 26, 2017 August 26, 2017 2 Comments on Solar Eclipse: ‘The End’ or ‘The Beginning’? Monday's solar eclipse in the USA provided a writing opportunity for merging my science background with gleanings from theological and faith practices. 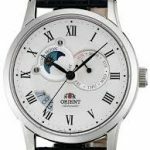 The timing of the eclipse---falling on the Hebrew date of Rosh Hodesh Elul, or the 1st day of the month of Elul, and exactly one month before the 1st day of Tishri or Rosh haShana, the Jewish New Year---was laden with significance. The Hebrew calendar is based upon the lunar cycle, and each Jewish month begins on the occurrence of the new moon. This is different from other cultures whose calendars are based upon solar cycles, such as our civic Gregorian calendar. And it is the new moon, not the full moon, that is the significant phase of observance. "והיו לאתת ולמועדים ולימים ושנים"
"...they will be signs, for the set aside times, and for the days and the years." What God has created then with the sun and moon are not merely two planetary light fixtures, but objects in the expanse of sky above that provide signals to us for the observance of seasons and other specially set or appointed times. We observe that the moon has cyclical phases and have set the new moon as the beginning of the each new month. The crescent of new moon emerges after its disk has waned fully leaving darkness. In observance, we take time off, especially women, and look forward to the moon's cycling back to fullness. The eclipsed moon disk signals the time of pause before a new cycle begins; it is the hidden becoming manifest; the time to reflect upon what had been and what can be; the grieving of what was unfulfilled and the anticipation of success in the future. We are given the monthly gift of renewal. On the science side, according to NASA a solar eclipse occurs when the moon, earth and sun are so aligned as to block one another's light during the moon's orbit around the earth. A solar eclipse can only happen if the new moon phase passes near one of the angular nodes of the moon's orbit around the earth, explaining why there is not a solar eclipse with every new moon. So the month of Elul in the USA this year has had two birth phases, the lunar new moon and the solar eclipse, both by biblical and scientific reckoning. This solar eclipse held special spiritual significance for many. I wanted to know what that was like for different peoples. I studied surveys of various ethnic and cultural groups to understand. 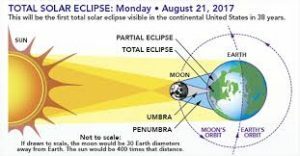 What I learned was that for cultures that base their calendars and reckoning on the sun, such as we do in civic North America with the Gregorian calendar, a solar eclipse can be an ominous event: The great object that provides light, safety, energy and food---disappears. For those whose culture is solar-base, even for the 2-1/2 minutes of the total eclipse, this is an ominous portent for some. Theological and liturgical explanations include: heralding the Rapture which will whisk away Christian believers and leave behind everyone else to face seven years of awful tribulations; God's judgment upon humanity and against human sin; kings were not able to stop the sun's disappearance, even by royal decree; Ancients filled the skies with other gods; Judaism, with its plethora of blessings for every natural event, has none for a solar eclipse. Other traditions see the eclipse as a time for deeper introspection and prayer. In Judaism rather than providing a blessing, the Talmud gives lessons about the value of prayer at such times. In Native American traditions, commentators say their people see the time of solar eclipse as the liminal moment, the time between one world and the next. The National Museum of the American Indian set up a blog for indigenous peoples to post what their traditions are, and indeed the imagery of prayer, of self-reflection and change, of imminent rebirth, were commonalities. This, then, is the time to pause and reflect on what has been; and upon what one may wish to step into as the light returns. Whether your practice or culture is solar or lunar-based, the one thing in common is that prayer helps to ground one's faith that indeed, the vanished sun or moon will indeed reappear. We have both God's Word on that, and NASA's. Our ancient ancestors didn't have NASA to explain the celestial events. Faith is the legacy they gave to us: that whatever happened in the past can be repaired as we pause in the liminal shadows and reflect on what and who we can be, in faith that the light will return. 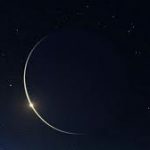 Published on August 26, 2017 August 26, 2017 Categories MusingsTags Elul, Faith, NASA, new moon, Rosh HaShanah, Rosh Hodesh, solar eclipse2 Comments on Solar Eclipse: ‘The End’ or ‘The Beginning’?